It’s December and winter has arrived in Caithness, sub-zero temperatures and ice and snow. Roads and pavements so slippery you see people walking over them as gingerly as if they were balancing on a tightrope with someone twanging the other end. People walking in slow motion, like an army of zombie tai chi practitioners. This far north, at this time of year the sun doesn’t get all the way up but describes a low, lazy rainbow arc across the sky, like a hungover college student who can’t be bothered to get out of bed. But at least some of the sunrises and sunsets are spectacular, so much so that I have to turn the radio on to make sure the nuclear power plant up the road isn’t getting frisky. I’m working on the back first, as is my wont, to make sure I get the pattern bedded in properly first. (It doesn’t really matter, but it means that by the time I do the front, the pattern is in my fingers, as it were.) Like all Hebridean patterns, the rich detail is pretty stunning, like a woollen mosaic. Right. Time for some parish notices. First of all congratulations to Lynne for this rather stunning cardigan. It’s from an old Vogue Knitting magazine, and the original designer is Isaac Mizrahi, though Lynne has freely adapted it. Just in time for winter! 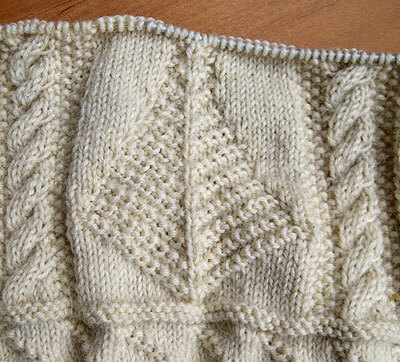 Secondly, we get a number of requests from people looking for someone to knit them a gansey (see Sam’s plea here). I’d like to add a page to the site featuring knitters who take commissions. So if you know of anyone who does this (or you do it yourself), please drop me an email. Hello Gordon, the gansey is looking very sculptured in the light wool. Nice work. Re: ice walking: my mother referred to this activity as Norwegian break dancing. Feel free to adapt at will! The light will begin to return soon, if the pagans do their Yule work. Fingers crossed. At least they know how to walk on ice. Where I live, people don’t see it that often and many either forget or never learn how. Be careful, it only takes one slip to really ruin your day. There used to be metal ice-gripper things that strapped onto your boots; do they sell them where you are? I wouldn’t be without my http://www.yaktrax.com at this time of year – I carry them in my car. 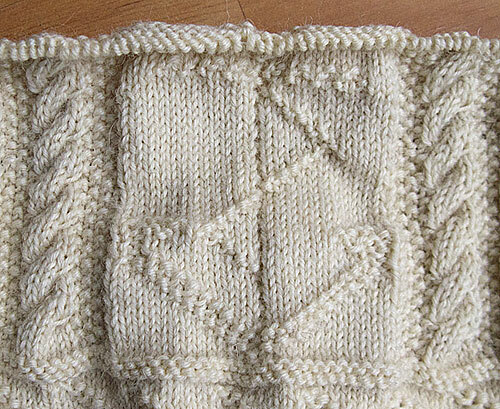 I’m loving the yoke on this gansey, Gordon, and so effective in the white- as you’ve done before. I’m happy with the dancing part—not so sure about the breaking! As for the pagans and Yule, I considered putting an advert in the John o’Groat Journal looking for a virgin to sacrifice, but thought it wouldn’t look good in court. But yes, watch your step on the ice. My former boss and good friend once fell over onto gravel and cut her palms so badly she had to have them bandaged like mittens. For a week she couldn’t use her hands at all, couldn’t do a thing for herself and learned a lot about herself and the need for a supportive partner who wasn’t squeamish! I like the anchor picking up the zigzag and the trees reflect the shape of the diamonds nicely. It’s a lovely sweater. And thank you for the pics and snips about your surroundings, Gordon. It’s such a different land from what I know that it’s stimulating my interest in visiting the Highlands. But definitely in the sunny months! Well, if I was Wotan, king of the gods, I’d feel a little short-changed if I was expecting a fresh, ripe virgin and all I got was fruit. I imagine for a god it must be a bit like being put on a vegetarian diet. (Wotan holds up a strawberry between thumb and forefinger and peers at it with his one good eye. 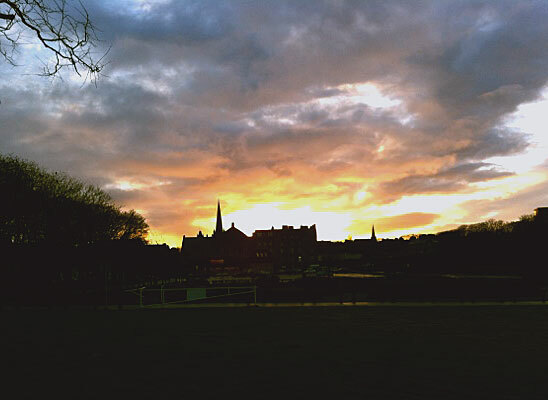 This is, of course, why the sun seems to have stopped rising in Wick. 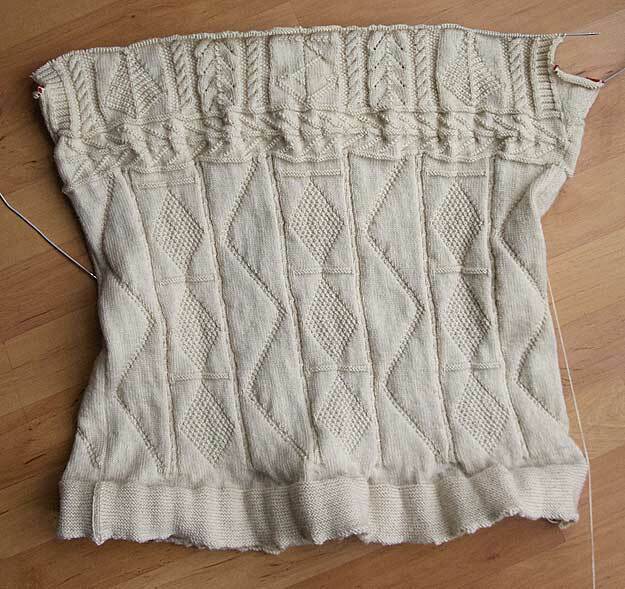 Far be it for me to bandy a lady’s vital statistics about the internet, not without private browsing switched on anyway, but Margaret’s Fife cardigan is a deliberately baggy one for lots of extra layers, and like the one I’m knitting now is a 44-45 inch chest. That was supposed to be “45 inches”. Need to learn to spell-check BEFORE hitting ‘post comment’.